Previously un-documented as a surviving piece of original Carl Barks art; the cover to WDC 321 just surfaced! The owner, Robert Wiener, wrote the following on his comicartfans.com page where he posted the art: "Carl Barks cover to Walt Disney's Comics & Stories #321, April 1967. I got this from Don Phelps in the 1970's in trade for a copy of "Donald Duck Tells About Kites". At the time they were equivalent in value but I think I made the better deal. (I thought so at the time.) I hadn't seen it for 25 years and found it last week when looking for something else. Long story!" 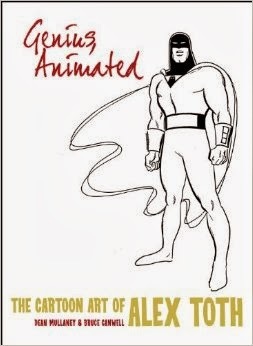 Now, I'm even more eager to get the last of the three Toth books: Genius Animated. To be published in May by IDW.